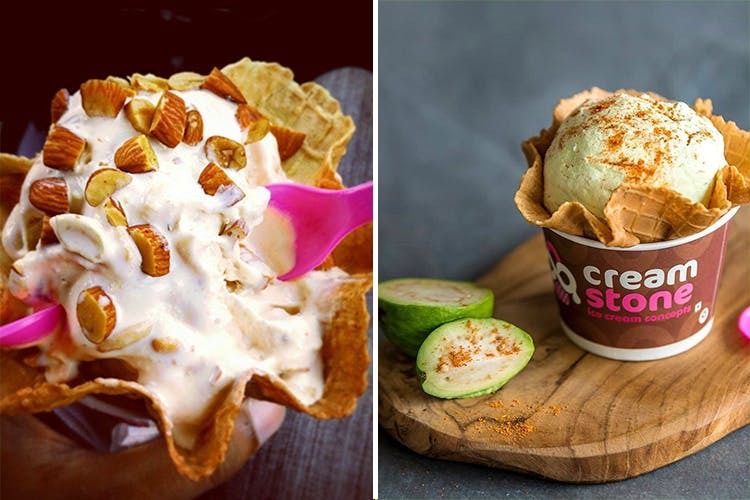 Nut Cracker Waffle Or Chatpata Guava: Have You Tried These 5 Weird Ice Cream Combos? Cream Stone is a popular ice-cream parlour, known for its innovative ‘concept’ ice creams that appeal to people of all ages. Here, the ice-cream is hand-mixed and mashed with toppings on a frozen ‘cold stone’, thus giving it multiple flavour and texture combinations that you wouldn’t get in a scoop of regular ice-cream. Here are 5 things you should try at Cream Stone. A chocoholic’s dream come true, La Ferrero (INR 135) is made with rich choco-hazel and chocolate ice cream mixed with ‘Perk’ and ‘chocosticks’, topped with Ferrero Rocher and chocolate wafer sticks. It’s chocolate-y and indulgent, with enough texture to keep you going back for more. This one is listed under the ‘Kids Concepts’ section of their menu, but we think it’s a treat for all ages. A duo of vanilla and strawberry ice cream, this combo also features choco chips, jujubes, choco stick, and Gems! Basically, Candy Land (INR 80) is your childhood served in a waffle-cup. Cream Stone also serves loaded waffles at a couple of their outlets (Viman Nagar, Baner, and Pimple Saudagar). The Nut Cracker Waffle (half INR 140, full INR 270) is an ideal combination for anyone who loves a bit of nutty goodness in their desserts. Served as a Belgian waffle topped with Cream Stone’s ‘Nutty Crunch’ ice cream, garnished with extra ‘crunchy nuts’ (think almonds, cashews). Ice Cream ‘Cake’ is an amazing combination – and at Cream Stone, you don’t even have to order yours beforehand! It’s ready-made (and frozen, obviously) and available anytime you feel like treating yourself. We think their Oreo Ice-Cream Cake (INR 950) is a surefire hit – with its crunchy cookie-cake base, and oreo-flavoured ice cream, it ticks all the right boxes! Fresh off their ‘Special Menu’, you must try their ‘Chatpata Guava Ice Cream’ (INR 99). Made with a combination of delish guava ice cream with fresh pulp, and a sprinkle of ‘chatpata tangy masala’ – this classic combination will leave your mouth watering for more! Don’t miss Cream Stone’s seasonal special – ‘Mr. Alphonso’. A rich mango ice cream generously topped with chunks of Alphonso mango, it’s the ideal way to cool down on a long, hot day!